Traversing Chinook Pass on the north side of Mount Rainier National Park, the Chinook Scenic Byway offers unique beauty and awe-inspiring views. Anchored by majestic Mount Rainier, the corridor traverses the mighty Cascade Range between Enumclaw and Naches along State Route 410. With a diversity of landscape from east to west, a variety of recreational opportunities are available. 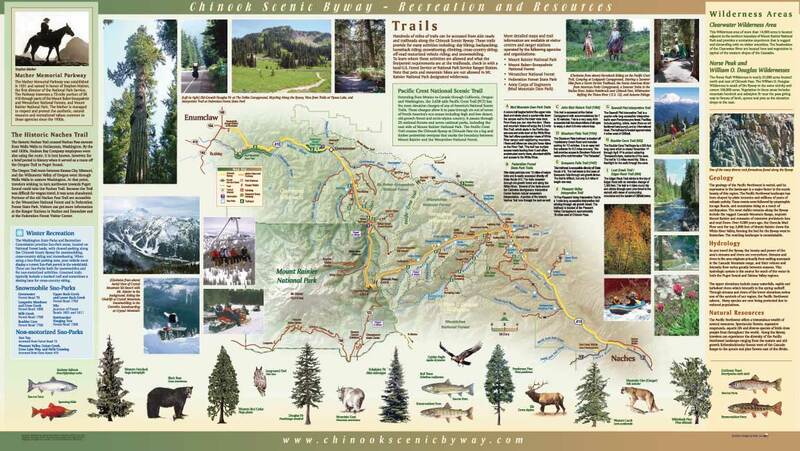 To the east of Chinook Pass are talus and basaltic rock formations in the Wenatchee National Forest and to the west are dense forests and rich vegetative habitats in the Mt. Baker Snoqualmie National Forest. Throughout the corridor there are many trails that lead from meadows carpeted with flowers to snow capped mountains and glaciers. Opportunities abound for hiking, climbing, snowshoeing, ski-touring, skiing, snowboarding, cycling, horseback riding, animal watching and more. Enjoy this relaxing drive while you journey through your senses. Return when your spirit needs replenishing. 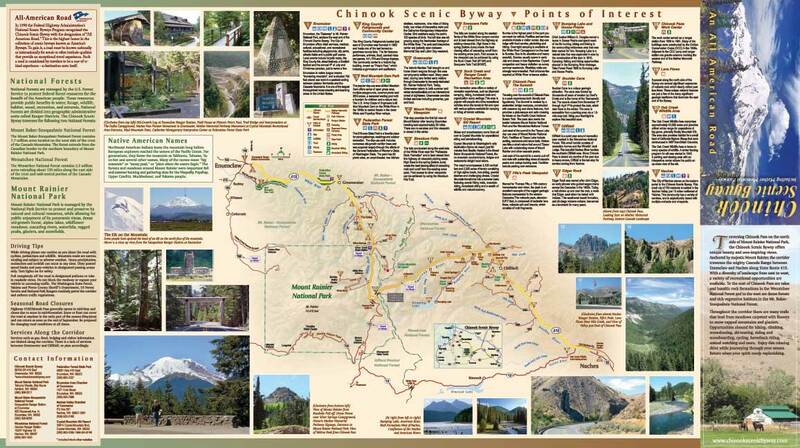 Pick up a FREE copy of the map at the Naches Ranger Station and businesses along Highway 410 before your next trip up State Route 410 into the beautiful Cascade Mountain range. The Naches Ranger Station is located at 10237 U.S. Highway 12, in Naches, (509) 653-1401.